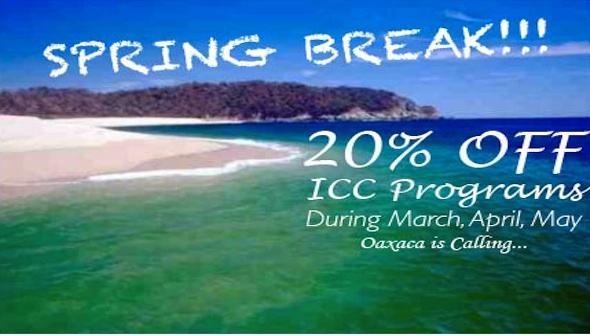 Oaxaca is a popular Spring Break destination, and the ICC is helping visitors achieve their dream vacation with a special deal this March, April and May. Guests may participate in any of the ICC's Spanish classes, tours, workshops or additional programs for 20% off the original price. Spring Break in Oaxaca offers an affordable vacation, during which tourists may become fully immersed in the local language and culture through ICC's time-tested programs. For Spring Break, Oaxaca is calling.